Art is a form of expression: it is how people reveal what is inside their souls to the world, using their creativity and imagination. 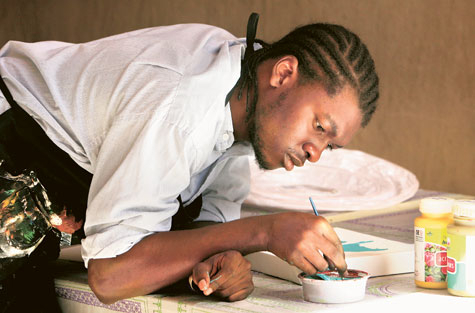 Victor Fitali, 21, cannot express himself to the world through speech as he is deaf and mute, so he chooses to do it through art instead. Fitali was born in Zambia and raised in the UAE. His parents discovered his condition when he turned three. He attended a school for children with special needs in Dubai, but upon reaching the age of 18, he found himself with nowhere to go and nothing to do. That was until he joined the Mawaheb for Beautiful People Art Studio in Dubai just over a year ago. "Mawaheb is the Arabic word for talent, and we are an art studio for young adults with special needs," said Wemmy de Maaker, managing director of Mawaheb. "There are lots of schools for children with special needs in Dubai, but as soon as they reach the age of 18, they have to leave school and are left with nowhere to go." Mawaheb has opened its doors to youth with autism, Down's syndrome and global developmental delay, and other special needs. However, Fitali's case is different to those of his fellow artists at the studio. "Unfortunately, there wasn't a school for deaf people in the UAE, so he had to go to a school for special needs. This has brought him to a certain level of education, but not where he should be," she said. "If he had gone to a special school for deaf people he would have been brought to the level of his peers, because he is perfectly sound mentally." De Maaker said the Mawaheb studio, located in the Bastakiya cultural district, is not a school as it does not offer counselling or therapy. It is simply a place for youth with special needs to hone their artistic talent. 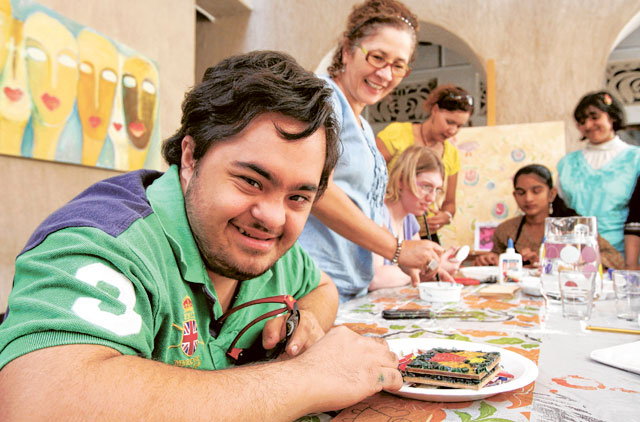 Therefore, the team at Mawaheb does not refer to the special needs youth as students but as artists. The studio has 16 artists between the ages of 18 and 31. "Most of them have been sitting at home for long and are happy to have a purpose in life, simply an occupation and something to do during the day," said de Maaker. "As you can imagine being at home for so long, they develop behavioural problems and depression, and the parents don't have any idea where to go with them." So just over a year ago, Mawaheb opened its doors to offer the parents of special needs youth a solution. "Although they work on their artistic skills, we also work on life skills," she said. "It's important they develop themselves as people and become independent, and are integrated into society." In Fitali's case, because he did not join his peers at university, his parents sought an alternative route for a sustainable career and therefore enrolled him at Mawaheb. "We found out he has real talent in painting," said de Maaker. "We discussed with his parents that we'd like to have him another year, in order to set out a plan for him; to give him wings to become an independent artist." A realistic plan it would seem, as UK artist Trevor Waugh, who works as a resident at Dubai's Majlis Gallery, has offered to take Fitali under his wing. Waugh has also illustrated for the likes of the BBC, Penguin and Collins, has authored several books and is a regular contributor to The Artist magazine. "Trevor came to do a workshop at Mawaheb but completely fell in love with the people and the concept, and started working with everyone especially Victor," said de Maaker. "He's planning to take him to England for a month next year to mentor him and to show him how to work as an artist, and how to set up an art studio and earn a living." Yet, if it was not for Mawaheb, the truly talented Fitali would have missed out on an artistic opportunity that has the potential to change his life.